This is a real program and not an article about a program or how to make a program better. To print, on the left of this text you will see a "share" button. Click this and in the search engine, type "PrintFriendly". This is the best file and format to save and print a copy. Few powerlifting programs have generated as much interest as conjugate periodization (AKA Westside). While the program is certainly effective for a vast population of lifters, it’s not exactly the easiest to follow correctly for lifters with a limited training history. The following is a variation that I’ve used successfully for some of my clients that limits some of the variables that can derail inexperienced lifters. Is it totally idiot proof? Nope, but it’s a great introduction to one of the most popular strength programs in the world. Respect – It’s not my club, nor do I train there. I do not like the idea of misrepresenting my program as something Louie has somehow signed off on. Accuracy – While this template is based on Louie’s, they have not, to my knowledge ever used it as written here. In fact, I’m almost positive they haven’t. Only those who train at the club can really claim to know what they do day in and day out. And for that matter, the template itself is a small part of why the club is so successful. In fact, having visited, and spoken to some of the members at length, I would say that the coaching and environment are probably more crucial to the club then the template. Basically, unless you are actually training AT Westside, you are not “training Westside”. This article is written for those out there who want to start a conjugate program, but are unsure where to begin. If you are a regular reader of elitefts, you are probably at least casually familiar with the original conjugate template written by Louie. If not, there is a TON of information on the Conjugate System on elitefts.com, including this extremely thorough breakdown by Dave Tate, in The 8 Keys. Additionally, any exercise named below can be looked up in the elitefts exercise index. On this day, you will perform an exercise similar to the squat or deadlift, up to a 1-3 rep max. Exercises can include various forms of the box squat, rack pull, deficit deadlift, and good morning, performed at a 1-3 rep max. This movement is usually rotated each week. The meet-style lifts are not performed until the meet. On this day, you will perform an exercise similar to the bench press, up to a 1-3 rep max. Exercises can include various forms of the board press, floor press, close grip bench press and rack press, performed at a 1-3 rep max. This movement is usually rotated each week. The meet-style bench press is usually not performed until the meet. Speed squats are performed as a wide stance box squat, in order to teach you to sit back in the squat and to fully recruit the hamstrings, glutes and lower back. Additionally, box squats build strength out of the hole and assure that you are squatting to depth. The weight is kept at around 50 percent (often waved from 45 to 55 over 3 weeks), and use of bands and chains for accommodating resistance is common. Speed benches are performed with a closer-then-competition grip, in a touch and go style (no bounce). Like the speed squats, the weight is kept at 50 percent and can be waved over the 3-week wave. As any experienced lifter can tell you, there is a LOT more to the program, but the above is a basic breakdown. Conjugate is a GREAT style of programming but presents some challenges to the beginner, all of which are addressed in my template. Variety – Conjugate thrives on variety in exercises, especially with regard to max effort exercises. This is why tools like special bars, bands, and chains are used. Most beginners do not have access to these toys, which limits their options. Hell, in today’s Planet Fitness inspired fitness industry you are lucky if your gym has a quality barbell and rack. On this template, the exercise selection is limited so that all you need are a barbell and rack. Coaching – Most novices, unless they are lucky enough to train with an experienced group, do not have the benefit of coaching, making it tougher to learn technique in the competition lifts. In this template, there is a skills day, where you will be practicing the meet lifts in place of a special exercise each month. 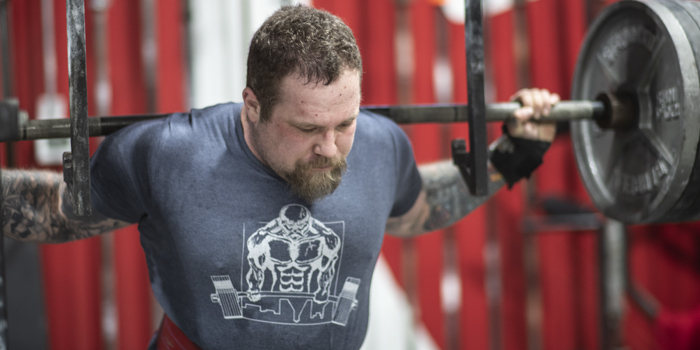 Exercise selection – Experienced lifters know how each special exercise carries over to their meet lifts, and what the general correlation should be between lifts. On this template, exercise selection is limited, with each special exercise repeating every month. With fewer exercises in the mix, it will be easier to note the carryover from the special exercises to the meet lifts. Note, this program is written as a MEET CYCLE and is designed to be completed with a competition. I’ve always been of the belief that beginning powerlifters should compete early and often, in order to gain meet experience as quickly as possible. This template calls for only 3 special exercises per 16 weeks. You will be working up in each exercises once per cycle/month. In month one, you will go to a 3 rep max. In months two and three and four, you will go up to a 1 rep max. I like keeping the first week to a 3rm in order to reinforce technique. For the squat/deadlift, pick a version of the goodmorning, deadlift and low box squat. For the bench, use a close grip full-range bench, rack press and floor press. Board presses also work if you are able to get multiple training partners to help you. If you are just going at it alone in a commercial gym, you know how tough it can be to find a good spotter so stay away from exercises requiring more than one. Speed work will be just about the same as on the traditional WSB template. For squat/deadlift perform 8 sets of 2 on the wide stance box squat. Wave the weight from 45 to 55% of your 1rm free squat over 3 weeks, then start over at 45. 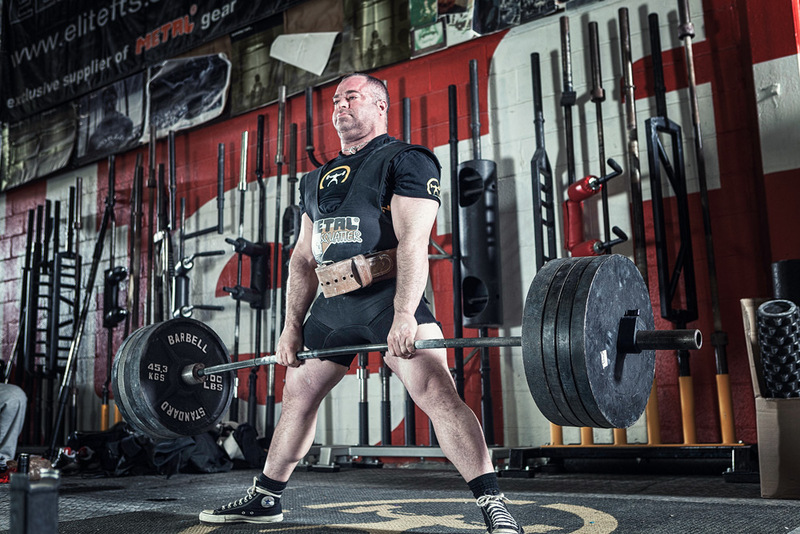 Following the squat, hit 6 singles on the deadlift waving the weight from 65-75% of your 1rm. Rest intervals between lifts should be kept to about a minute. For the bench, use 9 sets of 3. Changing your grip every 3 sets, I tend to go from pointer-finger at the smooth, to between the line and the smooth, to pinky on the line. Wave the percentages from 45-55% of your 1rm. Before you even ask, I do NOT recommend using bands and chains for your first conjugate cycle. Not only are they unnecessary for beginners, but they are one more variable that can muddy the waters while you are trying to learn a new training protocol. Following your max effort or speed work, you should be doing at least two assistance movements. For your squat/DL days, you should be hitting at least one posterior chain (hamstrings glutes, lower back), and one abdominal exercise. For the bench days, at least one upper back movement and one triceps exercise. As mentioned earlier, this template consists of 4 cycles, each lasting 4 weeks, for a total of 16 weeks (17 if you include the deload for the meet). The exercise selection is really up to you, based on what you think you need. You do not need to use the exercises as written. I actually encourage you to experiment so that you will find what works for yourself. For the sake of the demonstration, The Squat/DL Max Effort exercises I’ve selected are the Low Box Squat, rack pull (lowest setting on your rack) and the low box squat (2 inches below parallel). Rest from Thursday until meet. On days where you break a pr, don't get too aggressive and keep going until a miss. If you break a pr, it's an indication you are on track, so don't beat yourself up more than you need to. On a day where you miss a pr, consider doing some extra assistance work for the muscle group you believe is your weakness. Extra workouts are fine, even encouraged. Keep the weights light and the movements small. This is a great time to add in some extra ab, upper back and hamstring work. The speed work weights might feel too light. DO NOT RAISE THEM. The point of speed work is to produce lots of force on a sub-maximal load. Feel free to make exercise substitutions if needed, but make sure the new exercise is similar enough to accomplish a similar purpose. For example, a board press is a great substitute for a floor press. A lying triceps extension is not.